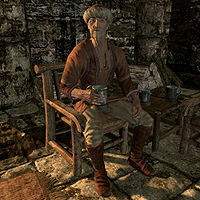 Elgrim, an elderly apothecary, is the proprietor of his namesake store Elgrim's Elixirs. He looks after both his wife Hafjorg and his promising apprentice Ingun Black-Briar. Should anything happen to Elgrim, his wife will take over the shop. Elgrim's daily routine is heavily bugged so he will act unlike any other merchant. His shop is open 24 hours a day, regardless of what he's doing, so you will always be able to barter with him. However, Elgrim will sleep between 11am and 6pm and will then eat a one-hour dinner. He will then wander around the shop, at times eating, sleeping, or using the alchemy lab. At 2am he takes his lunch, then returns to wandering before it is time for breakfast at 9am. He finishes his routine with an hour of wandering before his bedtime at 11am. He wears typical merchant clothes with boots and a hat. He wields a leveled dagger (up to elven quality at level 20) and carries the shop key, a spare belted tunic, and a selection of middle-class items and gold. Additionally, there is a 75% chance he may carry a random potion, another 75% chance he will carry a random, rare ingredient and, lastly, a 50% chance he will carry either a paralysis poison recipe or an invisibility potion recipe. He also knows a few spells, specifically Flames, Firebolt, Lesser Ward, and Oakflesh. He comes off as quite impatient when you approach him, saying: "You here for lessons like Ingun? Or did you wish to buy something? ", "Do you have any idea how busy I am? My mixture could be burning as we speak!" and "Take a look at my supplies if you must, but do hurry... I'm not getting any younger you know!" You can then ask him if he works alone: "Hardly! In fact, I don't know how I get anything done with all of the distractions I have to put up with. My wife Hafjorg, well, she's a necessary evil I suppose. Not a lick of talent when it comes to alchemy, but she keeps me fed. Then there's Ingun Black-Briar. Bright young thing and a worthy apprentice, when she isn't wasting my rare ingredients." If you ask him why he chose to set up shop near the canal, he will respond: "The moisture in the air is better for the ingredients. It isn't every day that you get your hands on fresh nirnroot or painted troll fat. It also makes it easier to gather water when the canal is right out the front door. Besides, I also prefer the quiet. I didn't open this business for browsing. Come in, buy what you need and get out." He will finish conversations with a grumpy: "Yes, yes... goodbye." Elgrim: "Ingun, you clumsy fool! You've tainted our entire supply of Painted Troll Fat. You have no idea how hard that was to get." Ingun: "I'm sure my mother can compensate you for it." Elgrim: "I'll draft a letter to Rythe. If you could have it sent to Cheydinhal for me, that would make up for your blunder." Ingun: "I'll make sure it's sent right away." 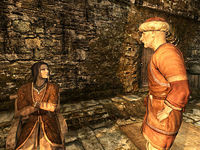 Ingun: "I don't understand, Elgrim. The formulas you're giving me are for novices but I've advanced well passed that point." Elgrim: "Until you can do those formulas with your eyes shut, you'll never be ready to master the more difficult ones." Ingun: "This is an utter waste of time." Elgrim: "Ingun! If you want to remain in my shop as an apprentice I expect you to act like one. No exceptions!" Ingun: "Very well, I'll keep practicing them." Elgrim: "Don't you "dear" me! I had a bowl of Vampire Dust on my worktable not an hour ago and after you swept in there it's gone!" Elgrim will make a direct reference to the rarity of painted troll fat. Painted troll fat in Oblivion is a rare alchemy ingredient limited to a mere six samples in the entire game. Elgrim seems to have suffered severely from developer oversights. He was clearly meant to go to bed at 11pm, but his bedtime was set to 11am, making him sleep during most of the shop's intended opening hours. Additionally, his lunch package was set to 2am instead of 2pm. This page was last modified on 2 June 2018, at 18:38.